As we reported, Kanye's psych hospitalization put the 2017 portion of the tour on ice, with no restart date set. At the time Kanye was at UCLA Medical Center, sources connected with the rapper insisted the tour would go on, even though belatedly. 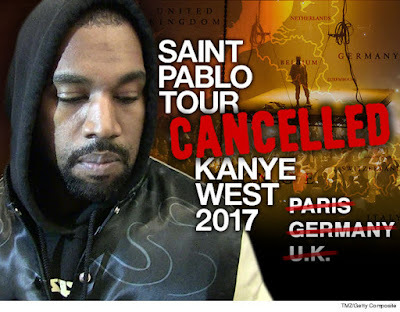 Now we've learned Kanye's people contacted concert promoter Live Nation and informed them the second leg which for the most part was European was officially cancelled. Among the planned stops -- Paris, U.K. and Germany. We're told cancelling did not pose real problems, because no dates were set and no tickets were sold. Kanye has an insurance policy that reimburses him for any lost profits or expenses associated with cancellations that result from a medical condition.